Luxury 5 Bedroom Villa ,private pool ,Air-conditioning. Spectacular Sea Views. This luxury private 350 m2 villa was completed in 2008; this lovely Greek style villa surrounded by Kalamata olive trees and rose gardens, at the picturesque historic village of Megali Mandinia with panoramic sea view. 50m2 private pool, 3 terrace, 5 bedrooms with sea view, 4 bathrooms, Internal pool shower + toilet., Separate toilet, 2 living rooms with sea view, rest area near the pool with book library, fully equipped kitchen with all facilities (dish washer, microwave, oven;), large dining room, flat screen TV with DVD and film library, Music library, washing machine, private tower for surround observation of sea and mountain view at sunset, walking distance to village bar\taverns and mini markets all open all year round; it is only few minutes' drive to the nearest sandy beaches with more taverns bars and coffee shops. Kitries harbour with its authentic fresh seafood restaurants is a 12 minute drive. Kalamata cosmopolitan city is only 15 minutes drive offering beach front restaurant, and active night life. The marina in Kalamata offers many boat trips, with fishing, sailing and windsurfing all popular activities. Boasting Blue Flag beaches along its beautiful stretch of coastline, visitors can either relax in the Mediterranean sun, or try snorkelling or scuba-diving in the crystal-clear waters. Day trips to Crete are also an option, with a regular ferry service leaving from the port at Kalamata. Stupa with its famous beautiful beaches is only 40 minutes drive. Summer is a great time to visit Kalamata as the city offers a host of cultural events, including a film festival, dance festival and a traditional folk festival, which takes place in the castle. Concerts, theatre and other dance performances are also held frequently here. Spectacular views from every corner and balcony of villa Elsie. Great clean air, our villa is private (not over looked) but not isolated. Authentic village, plenty of lovely Taverns within walking distance. At our local village supermarket you can buy organic fresh groceries. We enjoyed 11 days here with a group of 8 adults and 3 kids. The views across the ocean are stunning, and the villa was plenty spacious enough to accommodate our group. The pool was very well taken care of, which was a big attraction for both adults and kids. The decks are all large, and we ended up eating outside every night. We had a fantastic time here. The only reason I give it 4 out 5, instead of 5, is that a couple of the mattresses were not very comfortable and the wifi was spotty. We'd be more than happy to come back again. Kalamata is a great base for doing days trips in the Peloponnese. Great stay in Villa Elsie ! The villa is new, clean, very pleasant, offers many possibilities and with an amazing view over the Messenian Gulf. Terrasses with seaview and comfortable furniture at the pool, ground, and first floor. Lovely pool with seaview and barbecue. Climate control throughout the house. Ample and fully equipped kitchen (with cold beers and wine in the fridge on arrival day !). With room for over 10 people it was more than spacious enough for us (parents and 4 teenagers) but still very cosy. Close to Kalamata in complete rest but not lonely. Historic sites such as Mystras and Ithome at approx. 1 hour drive. The route to Mystras through the Taygetos mountans is really beautifull! Lovely beaches just down-hill (south of Akrogiali, 5 minutes drive) and in Stoupa (30 minutes by car). Many affordable restaurants and Greek taverns with good quality dishes for every taste. What else would one need for a very very nice and relaxing experience ! If we were to rank it on a review site, we would give 5 out of 5 stars ! We had a fantastic week at Villa Elsie - perfect location a short walk to the village with three tavernas to choose from and the villa itself was ideal, superb views and utter peacefulness. Would definitely recommend it as a base to explore or as we did a base to relax and unwind in. Together my husband and I chose Villa Elsie for a special family holiday. It was everything we had hoped for and the whole family had the most wonderful time. The villa is amazing. Spacious and easily accommodated the 10 of us, age range 10 to 77! 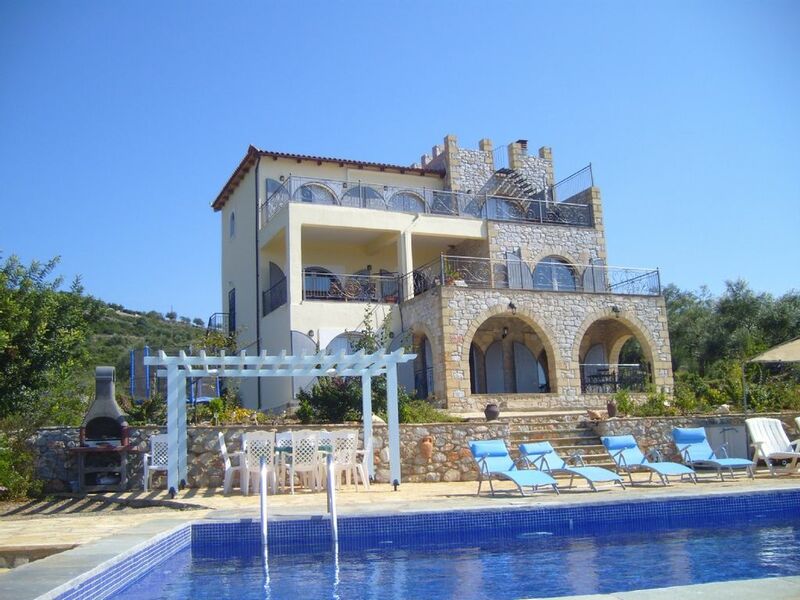 Fantastic views from all areas of the villa and a superb pool area which also suited everyone. At the end of our 2 week stay we were all sad to leave this beautiful villa and it's peaceful location. The housekeepers Pam and Gerry are lovely people and nothing was too much trouble. We were surprised to find such a small kitchen and dishwasher in such a large and beautiful villa and one of the 2 bedrooms described as single beds was in fact bunk beds, but at least they are full size. My 2 youngest grandchildren were happy to share the room with bunk beds. We all had an amazing and memorable time. We spent a week in this very cosy house situated far enough from Kalamata in order for us to enjoy the silence of the greek countryside but still not too far to be able to take a short trip to the city if needed. The place was clean, pool was just the right size. The view of the see and the city was fantastic from the terrace and we enjoyed it every morning and evening before going to bed. We are a family from the US, We stayed Villa Elsie 3 years ago. Had a great time then, and gain this year. Plenty of space, Enjoyed the evening walks to the restaurants in the village. We had a fantastic week. The facilities were great and it is very well maintained. The views are breathtaking. We had a relaxing week spending most of the time in the gorgeous pool. Perfect for a family holiday. The villa is situated in a really peaceful location, utterly tranquil. We enjoyed the evening walks to the village with its three equally good tavernas offering fantastic views across the gulf, perfect to go and watch the sunset. The local beaches and secluded coves are within easy reach. I would not hesitate in recommending Villa Elsie, perfect if you want to go and unwind. Location of Elsie's Villa is ideal to explore the regions. Beautiful countryside and coastal trails, natural charm with fertile olive groves, Byzantine churches and secluded hamlets. Nature-lovers will delight in the landscapes, bird-watchers will find a rich variety of species. You can be walking and hiking, horse riding and cycling. Kalamata city is only 15 minutes drive, with a historic centre home to churches, museums and castles ,With lively main square and cosmopolitan selection of shops, bars, restaurants and cafés, great night life, and vibrant harbour. The Market is open on Wednesday and Saturday – don’t miss buying the best local honey and olive oil. The marina in Kalamata offers boat trips, fishing, sailing , windsurfing and all popular activities. you can relax in the Mediterranean sun, or try snorkelling or scuba-diving in the crystal-clear waters. Day trips to Crete are great option. Diros caves- do not miss the Diros caves!